This is a remaster of a recording by someone from the audience on the night. As such it might not be as clear as most of the gigs on the archive. However, recordings of this tour are few and far between and all are poor quality, and some songs were never played live again, so I've done what I can to make this one listenable. I could write a book on all the work involved in fixing this one. Of 3 sources, I started work on one only to find that 1 track in particular had lots of noises I couldn't remove on it, so I started from scratch on the next best source. Hours of editing, volume balancing, selectively EQing different parts to reduce the effect of distortion, reducing large amounts of tape hiss without killing the recording altogether, as well as the usual EQ to bring out the instruments and voice...well, I'm glad to see this one done, put it that way! I hope you think its worth it. Another great post. I was at this show, nice to have a recording of it, thanks!! How cool, sounds a great band, wish I'd seen them. Cheers! Brilliant cheers for this! have had this recording for ages now so good to see it cleaned up. Great work ! Thank you very much . Thanks for this, Flip! I was, as you can imagine, thrilled to bit to hear a live version of "Crash." But the real stand out here is the extend jazz keyboard solo on "We Take Mystery (To Bed). 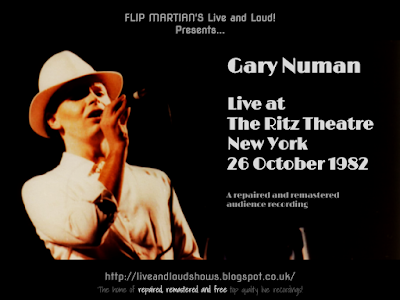 Nothing else quite like it in the Numan catalogue, methinks! Yeah its quite different, this gig. Glad you enjoyed, cheers!